2x3.5 Customized Indoor Magnets 30 Mil Round Corners will help you to take advantage of the love of people towards promotional gifts. Convert these custom rectangle and square magnets to complimentary gifts. Make these printable magnets look exciting by adding pictures and other useful information. Electronic stores, libraries, and supermarkets can make these magnets their promotional gifts. 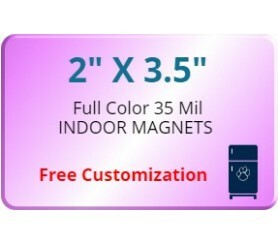 Order these magnets quickly and gain access to our free digital design assistance, free digital proofs, free full-color printing and also free shipping offers. 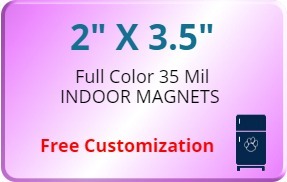 Request bulk orders of these 2x3.5 Customized Indoor Magnets 30 Mil Round Corners and know how much you can save on your promotions.